Perfect for sponging and brush work, each pot will paint 100 faces! 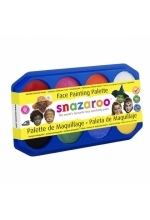 A professional quality Snazaroo palette with 18ml Black, White, Red, Orange, Yellow, Blue, Green .. Perfect for sponging and brush work, each 18ml pot will paint around 100 faces or one full body! ..
Black is the one of the colours you use most in face painting. A 75ml pot costs just .05c per ml .. The must have in your kit! Perfect for sponging and brush work, each 18ml pot will paint up t..
Great value tub. Snazaroo 75ml Classic colour - White Purchasing a 75ml tub saves you money! ..
Nancy says 'Striking when paired with Snazaroo Turquoise.' Perfect for sponging and brush wor.. Useful in special effects painting. Simulates fresh blood. Perfect for sponging and brush wor..
Can be used to simulate dried blood. Great for Zombie walks, Halloween and First Aid training..
Nancy says 'This colour is the perfect base for stage, theatre and costumed plays. Think the 3 Ki..